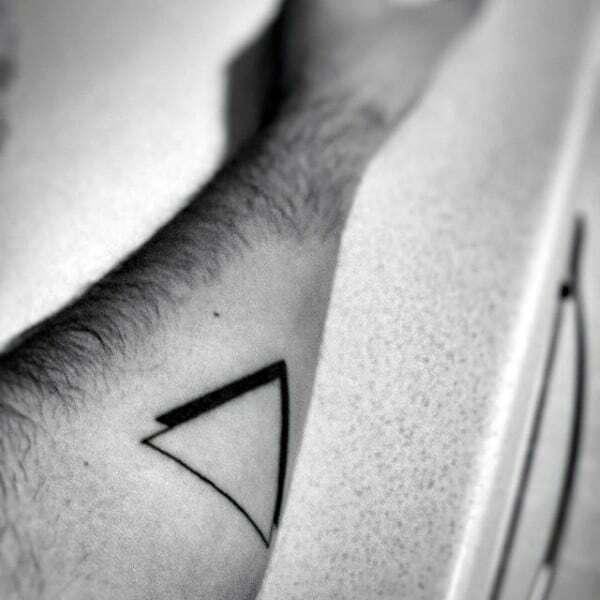 Equilateral, isosceles, and scalene… Remember those words from math class trickling back into your memory? 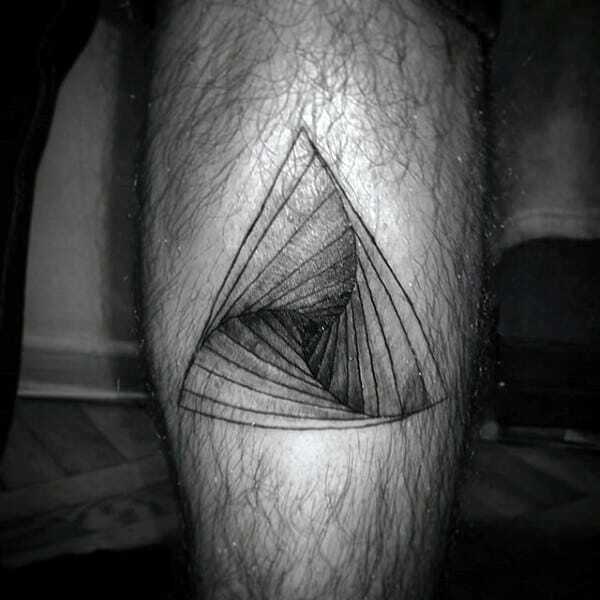 If you don’t, their the types based on length. 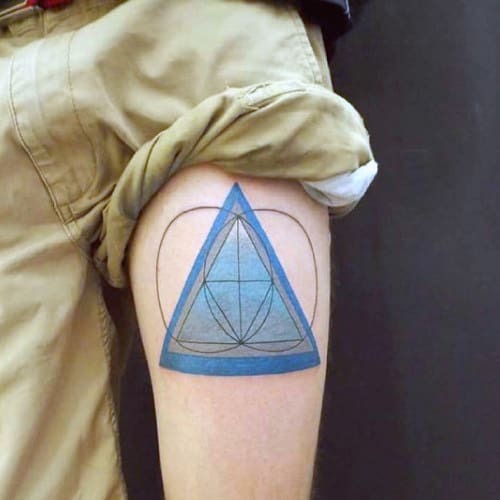 How about right, obtuse, acute and oblique? 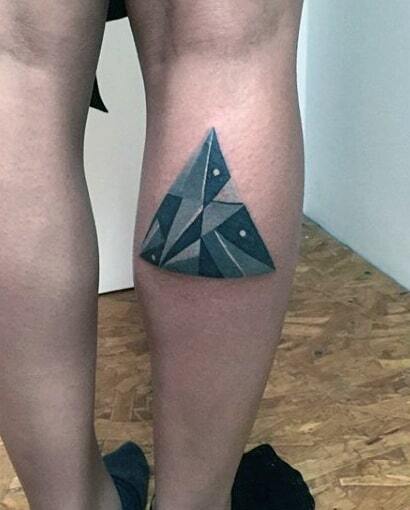 The angles, of course. 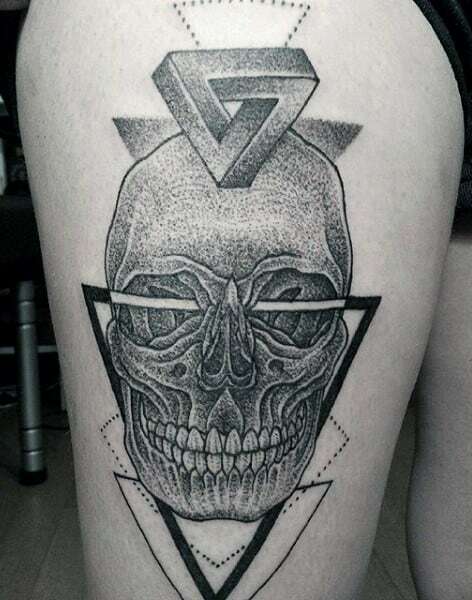 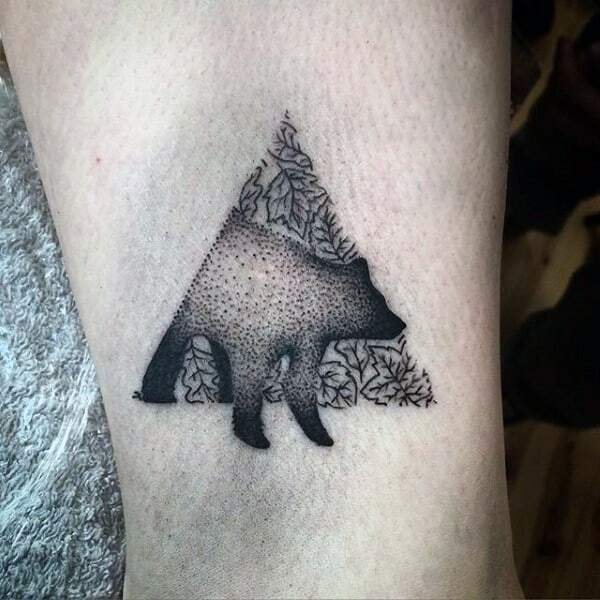 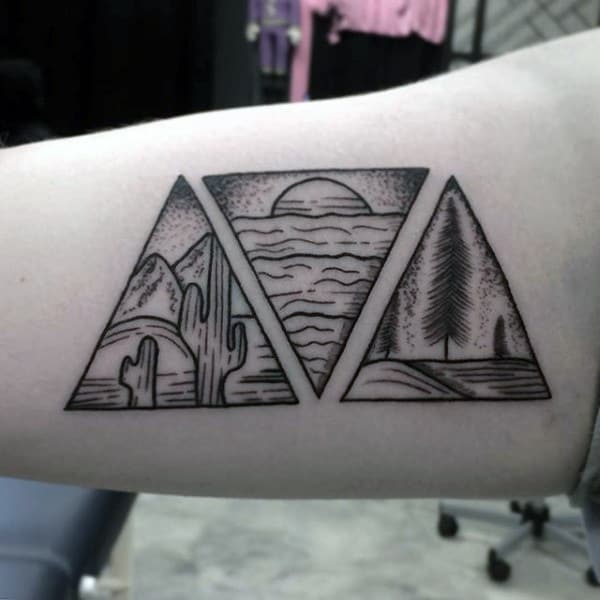 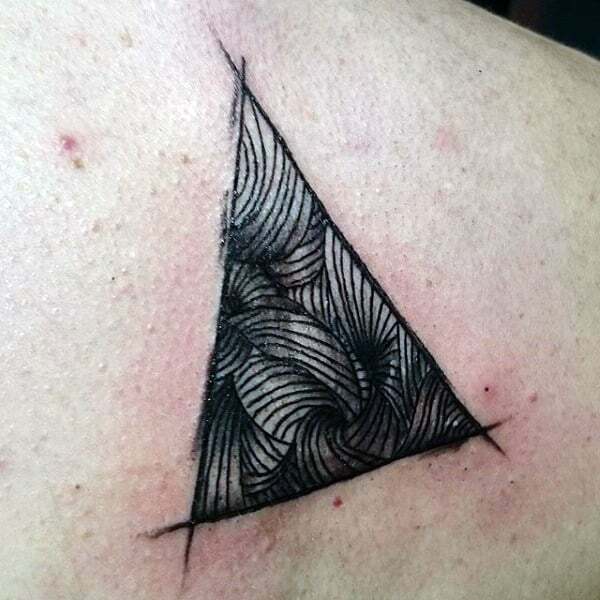 When it comes to triangle tattoos, there’s more to them than just the initial thought of mathematics. 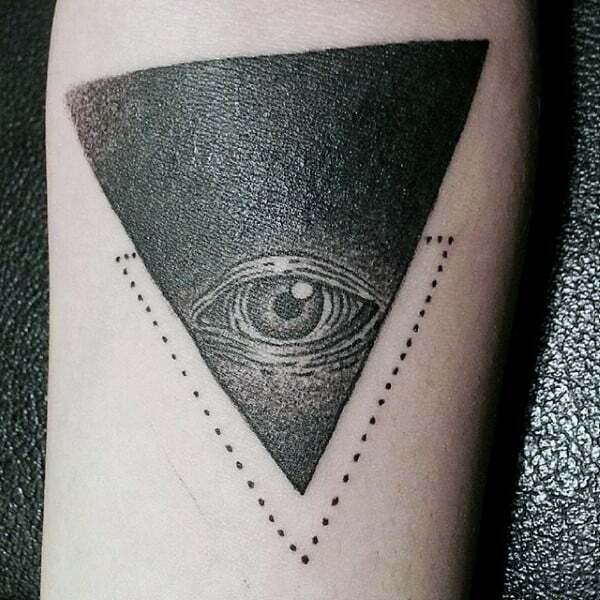 In reality, these three sided shapes store a considerable amount of meaning inside. 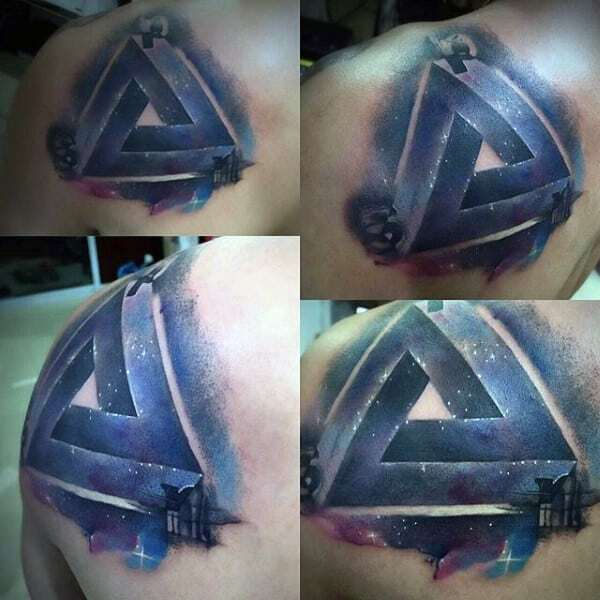 For instance, if you’re a Christian man, you might view the triangle as a symbol of the holy trinity: Father, son and holy ghost. 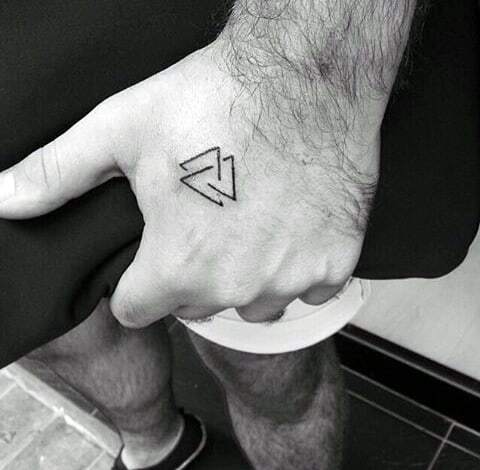 Religion aside, some simply interrupt them directly to the number three. 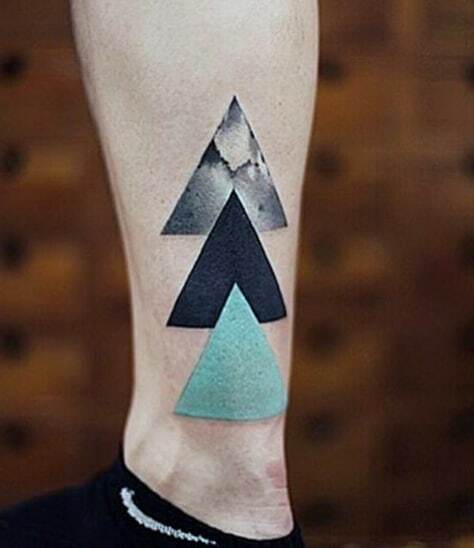 There are three sides after all. 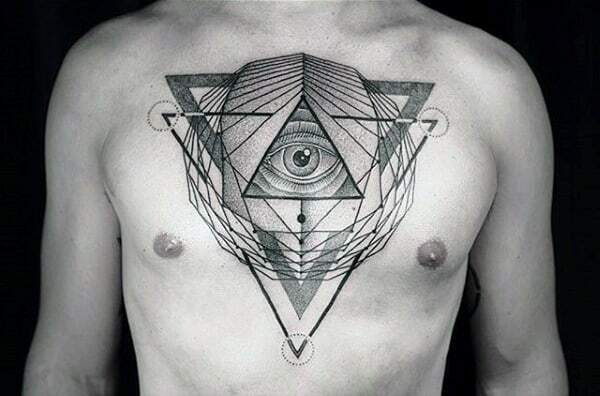 Other men view them with a more deeper train of thought with ideas like the past, present and future. 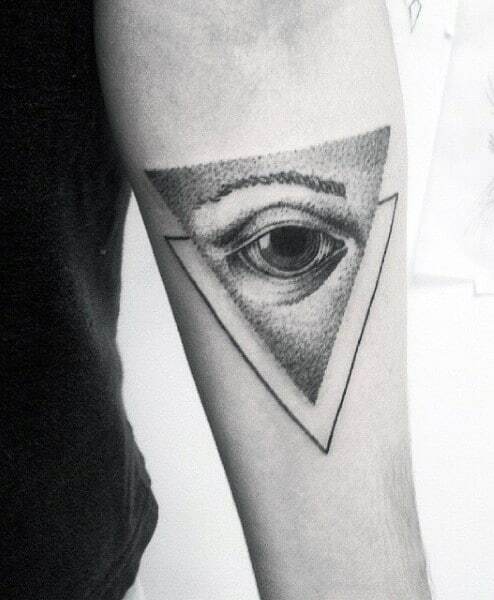 They can also symbolize the mind, body and spirit too. 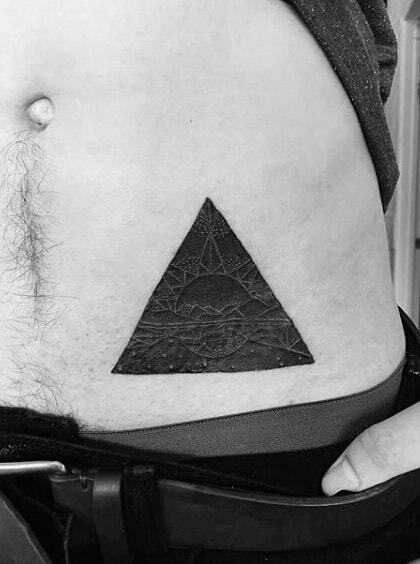 Some claim the pointed top is merely a symbol of the ascension towards a spiritual world. 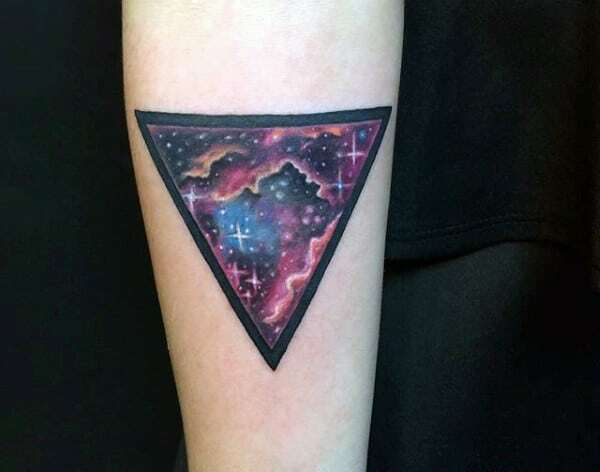 Yet, one of the most popular beliefs revolves around the direction of the triangle; in other words, is it pointed up or down? 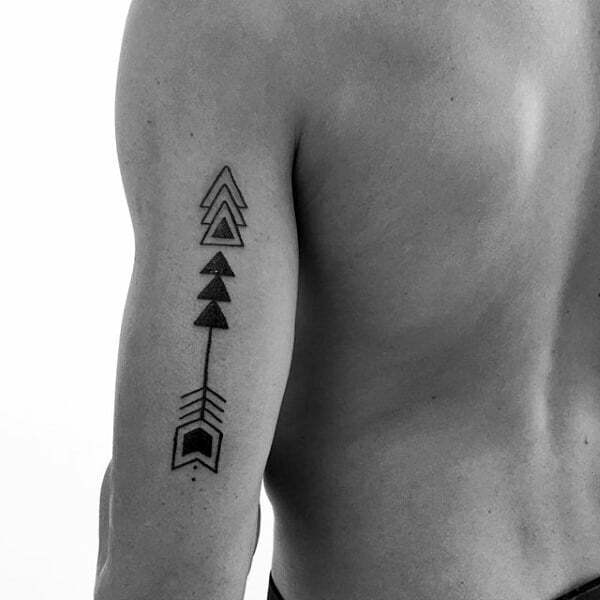 Pointed up represents male energy, air and fire; all masculine elements. 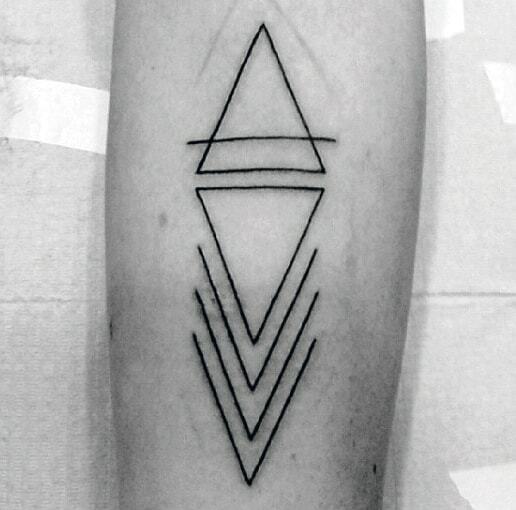 While female water, energy and earth tie into triangles facing downwards. 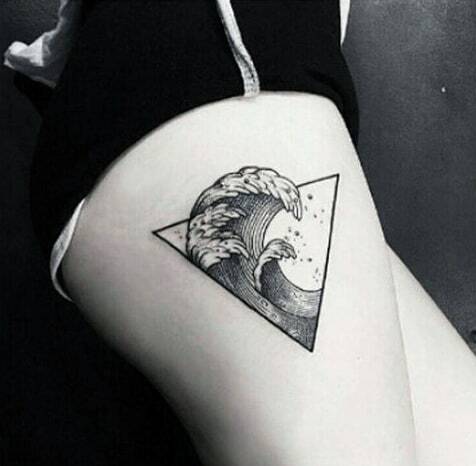 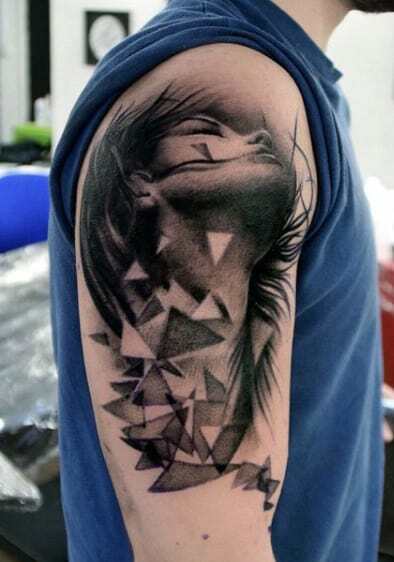 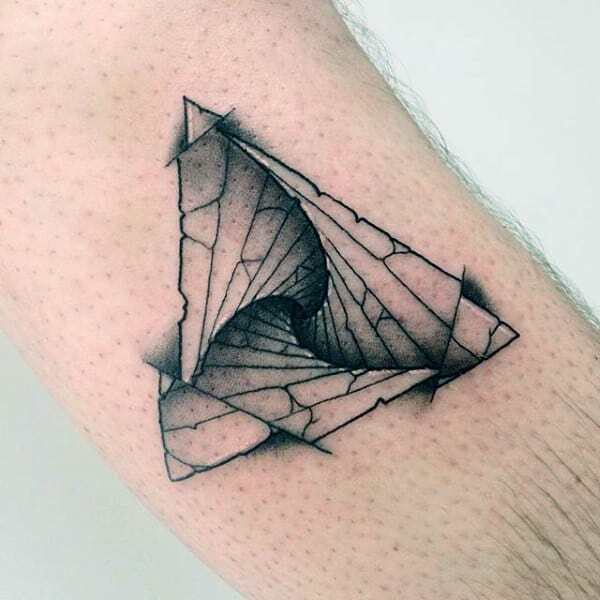 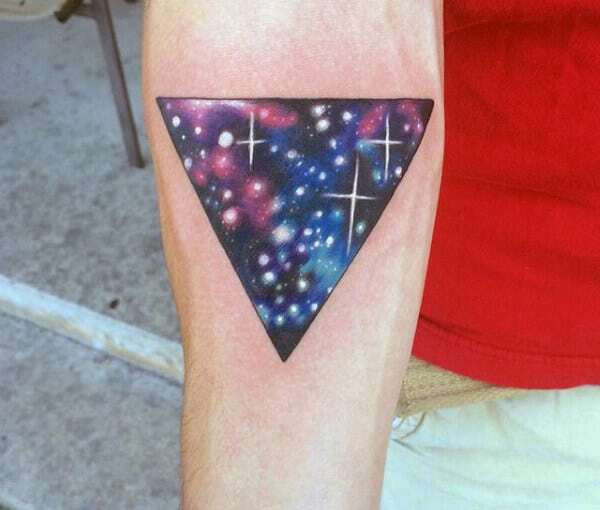 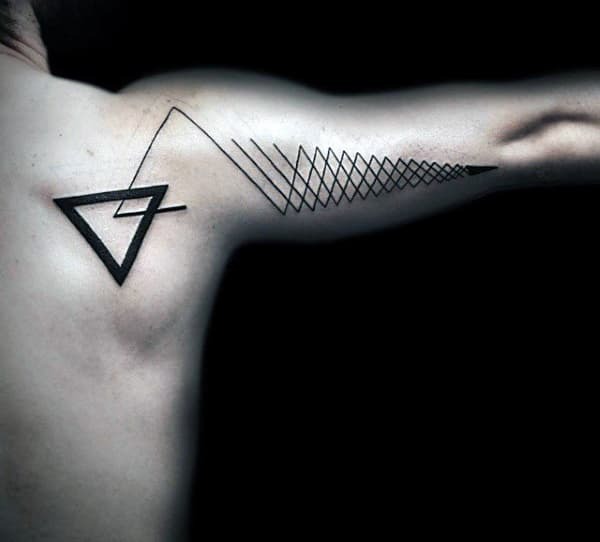 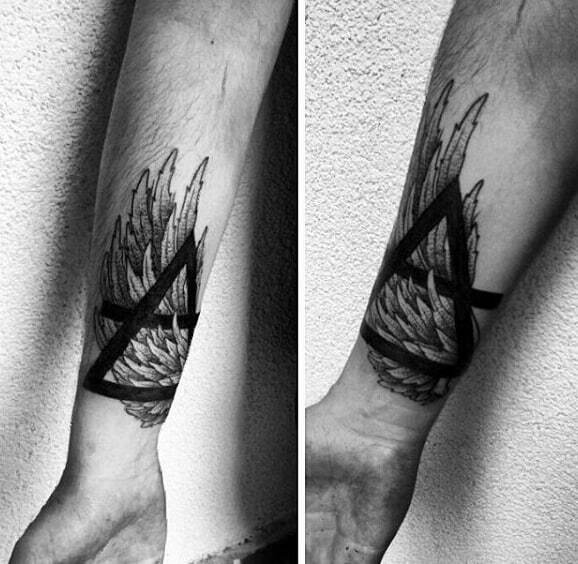 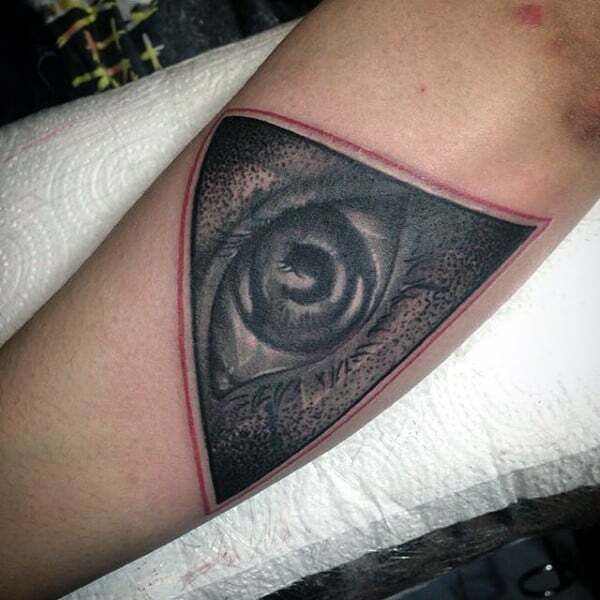 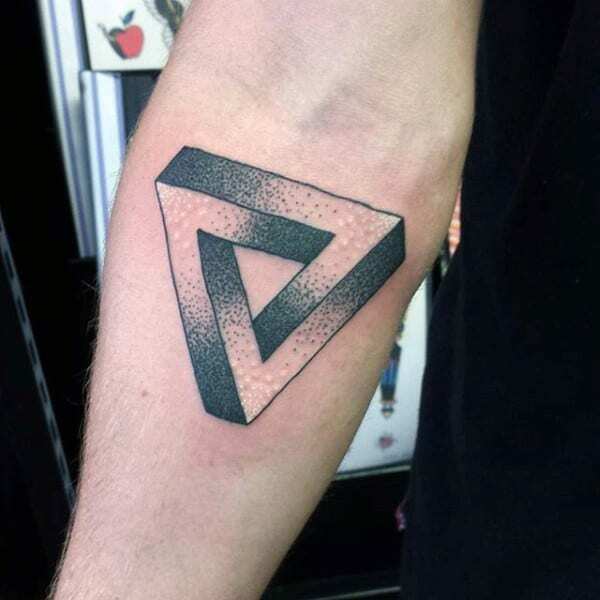 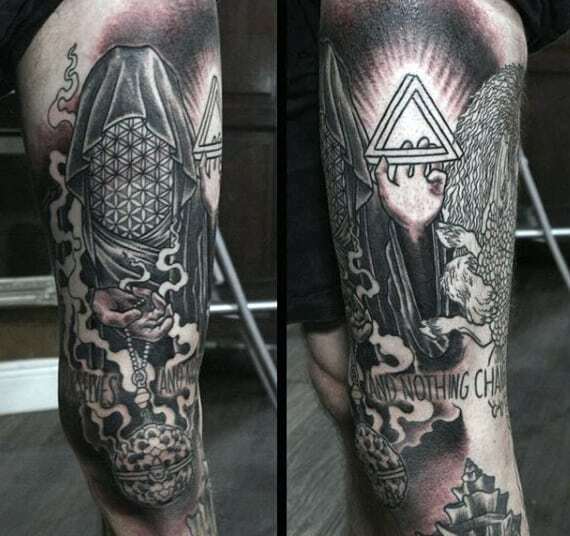 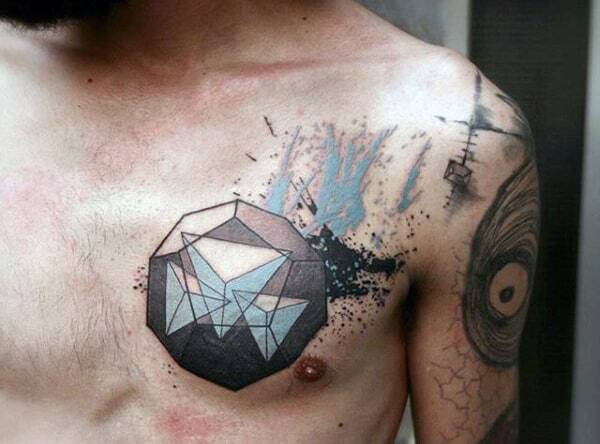 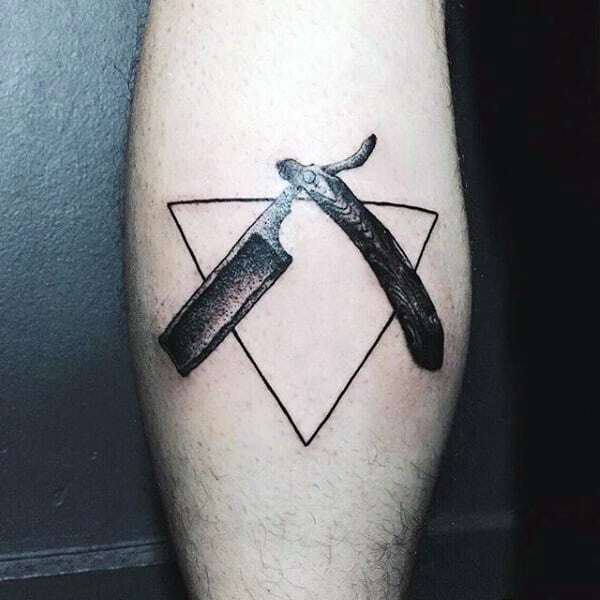 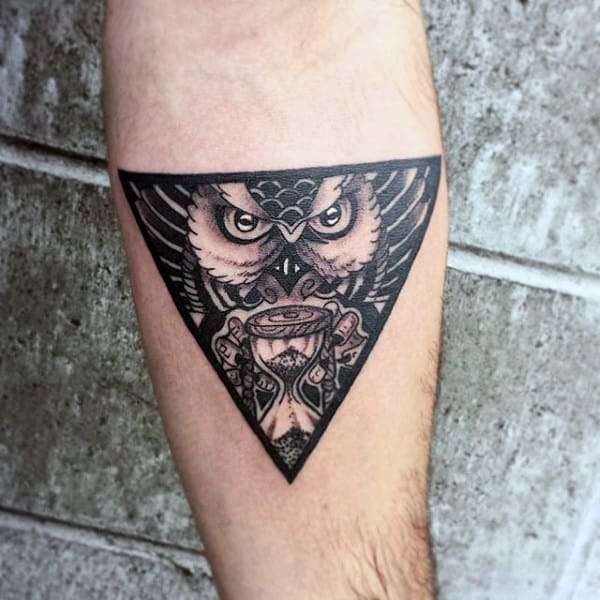 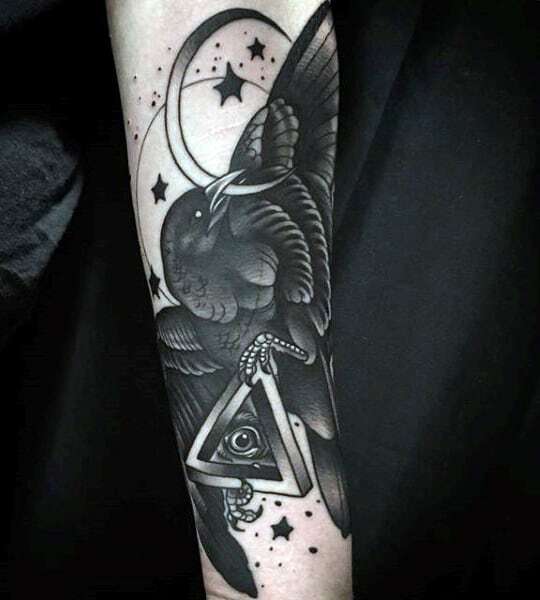 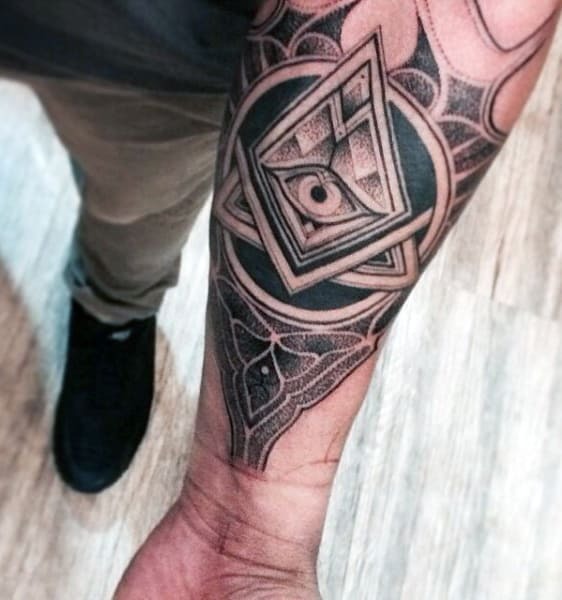 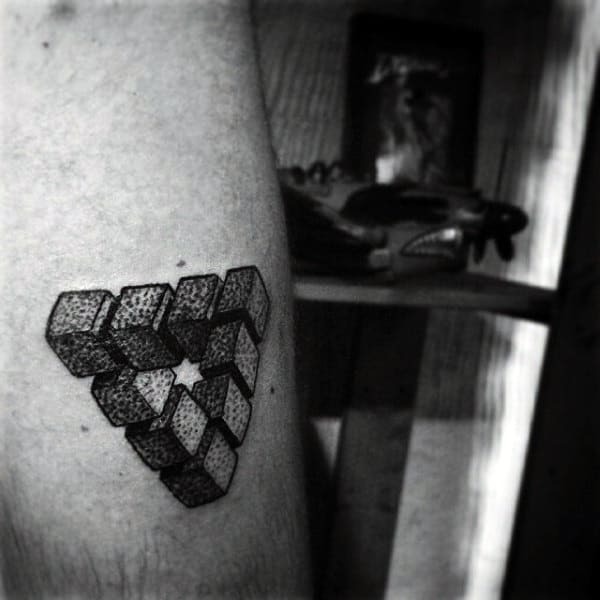 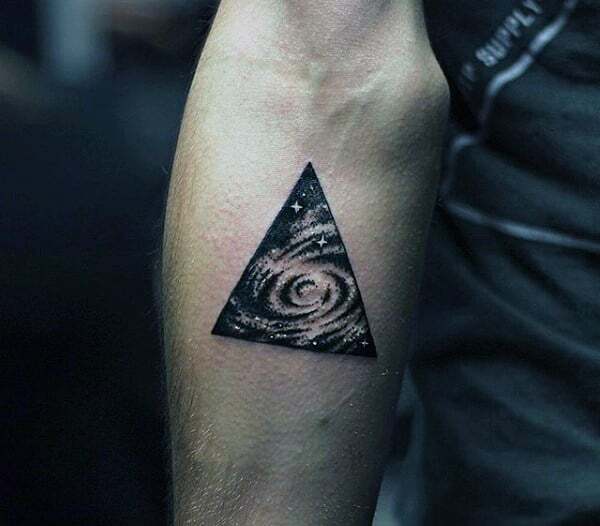 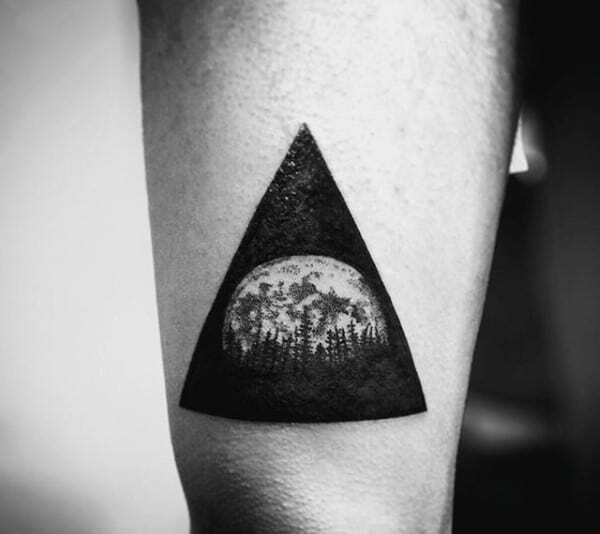 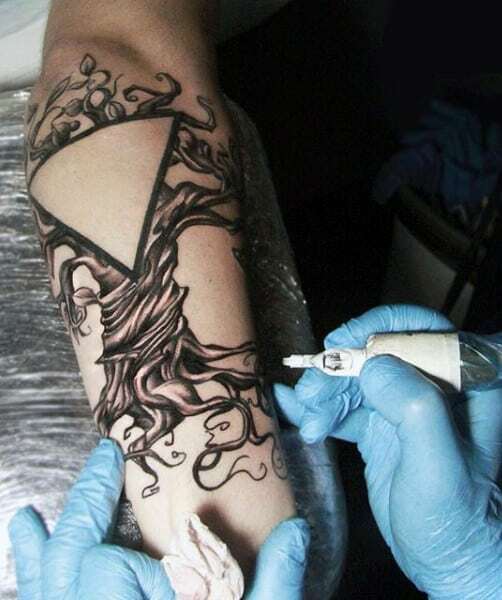 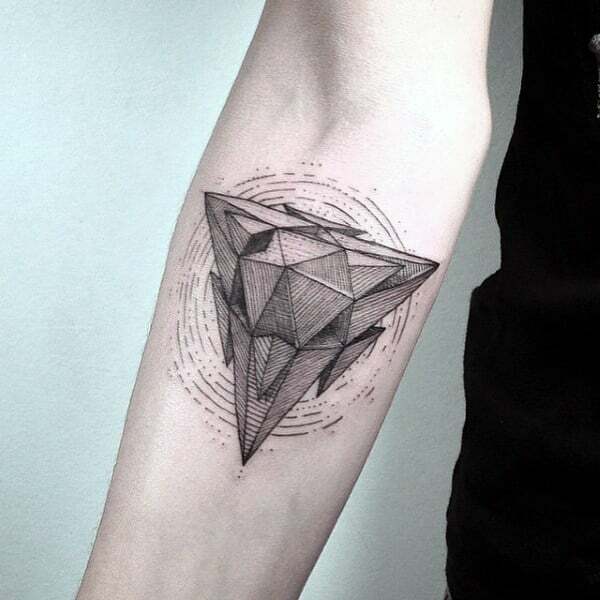 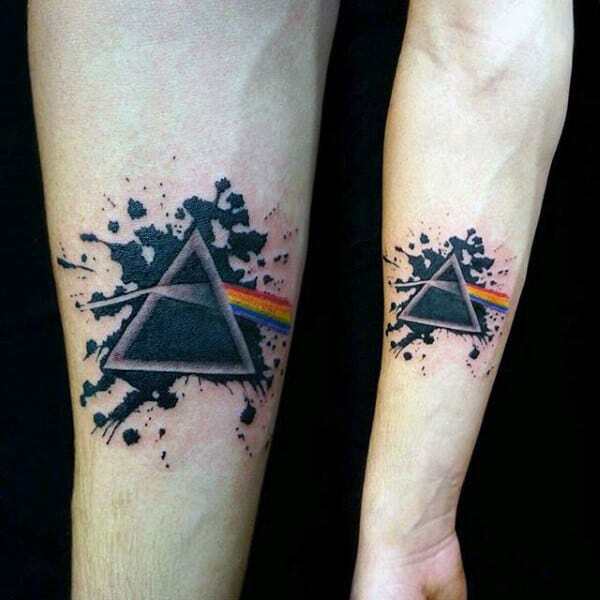 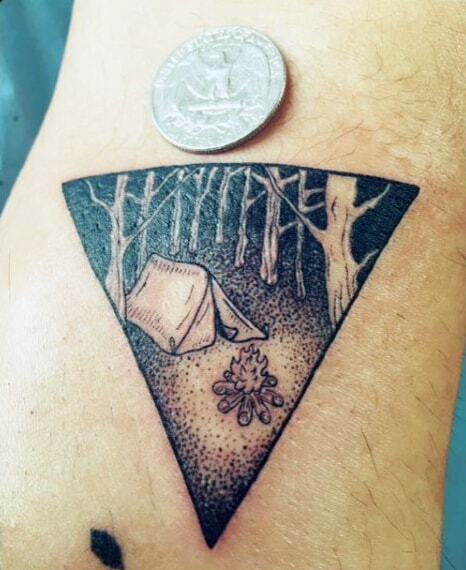 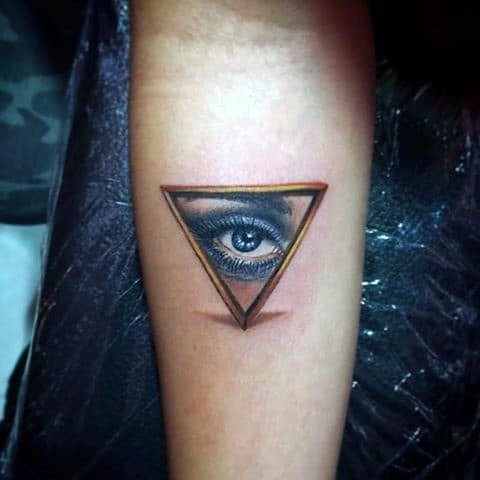 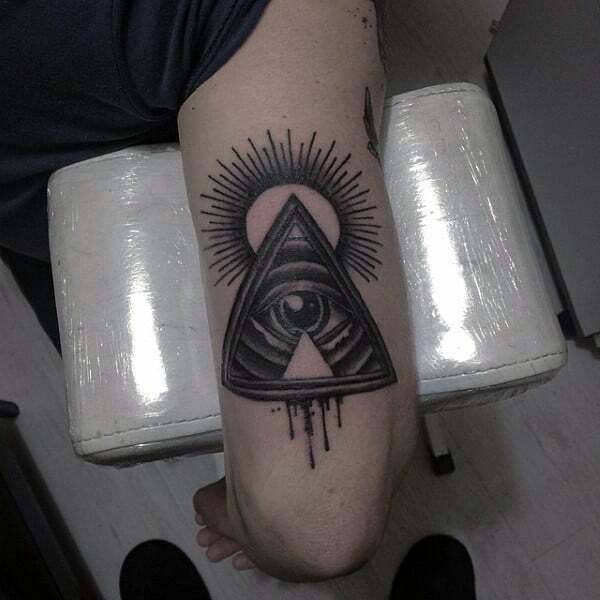 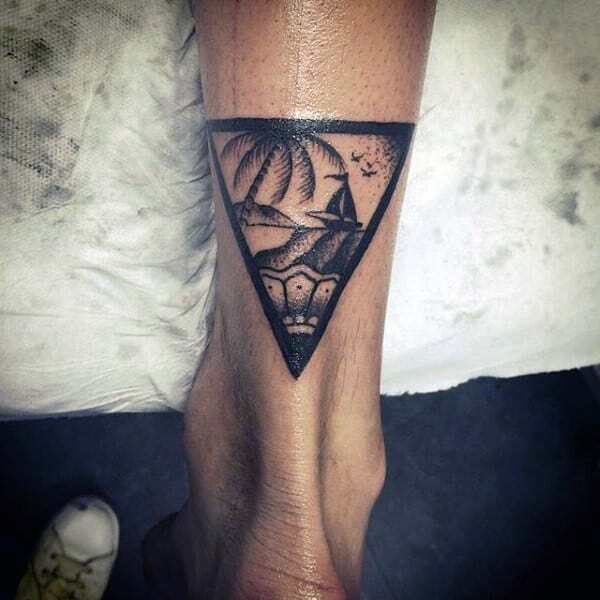 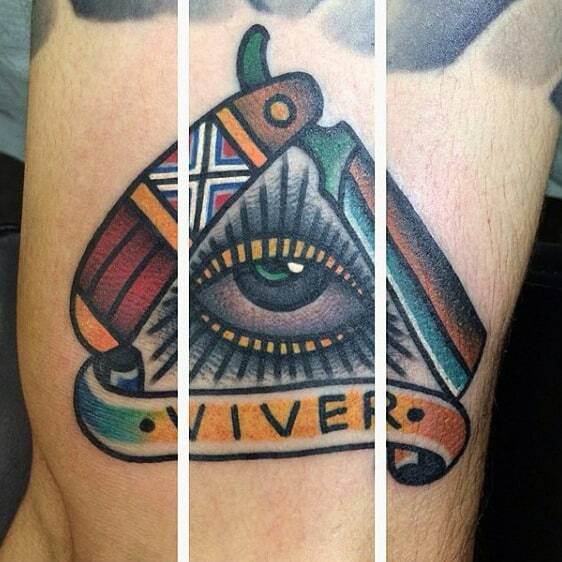 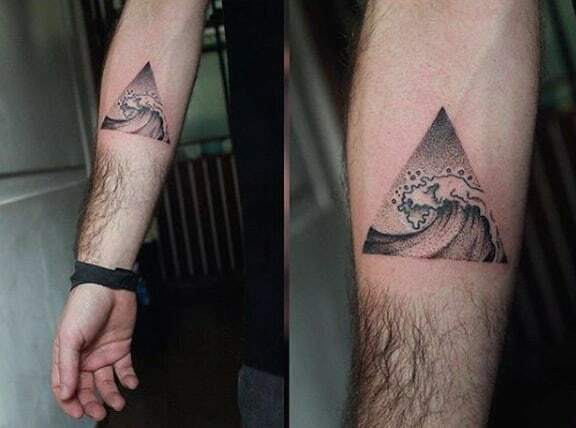 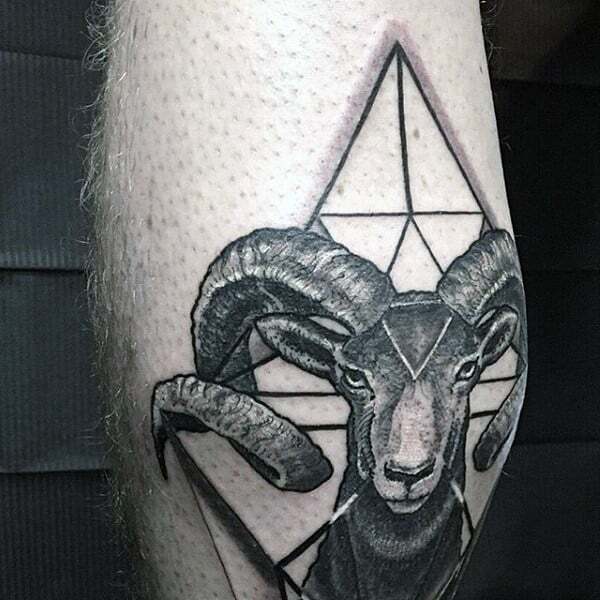 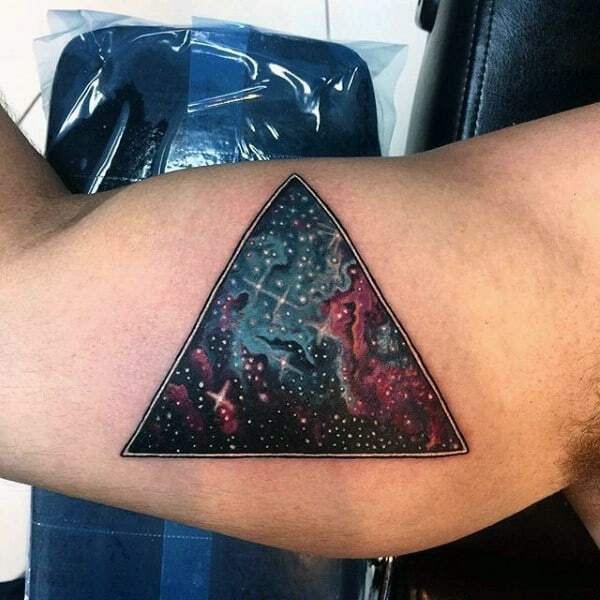 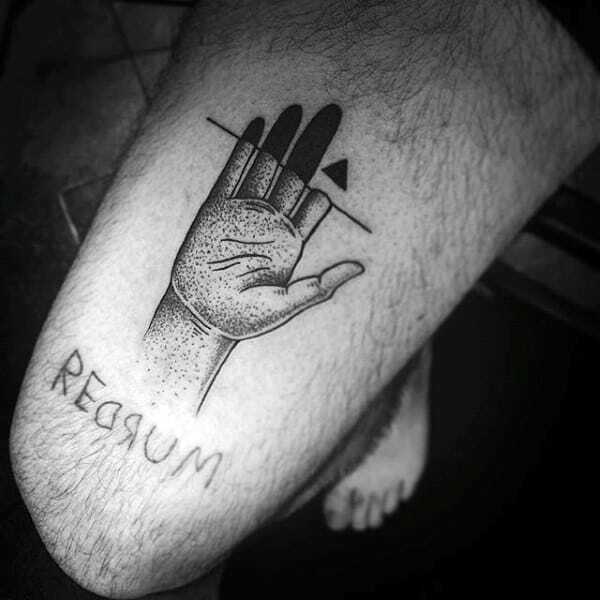 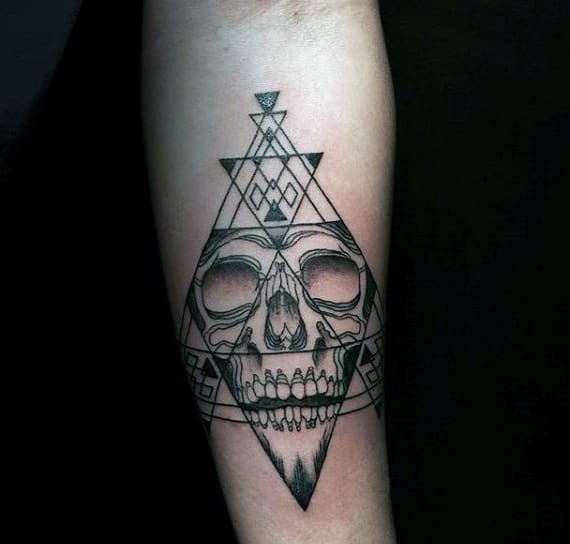 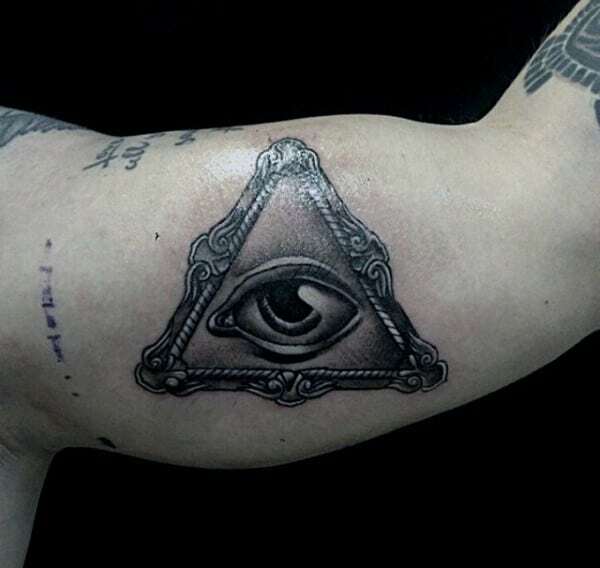 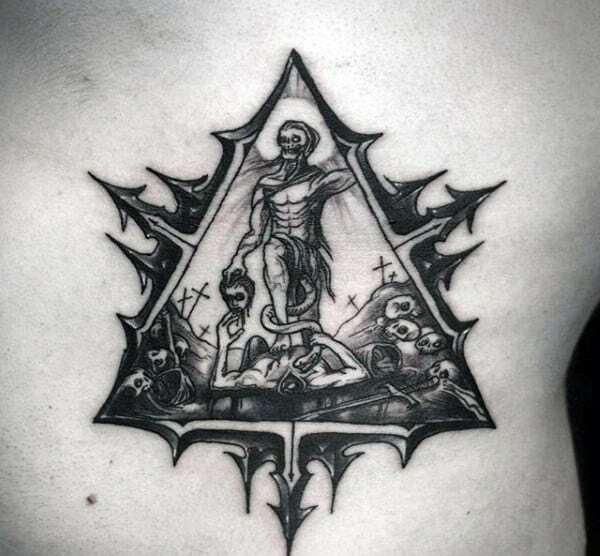 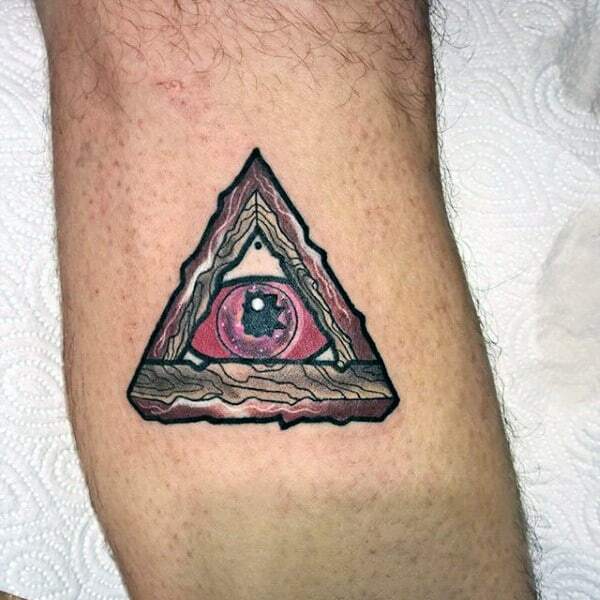 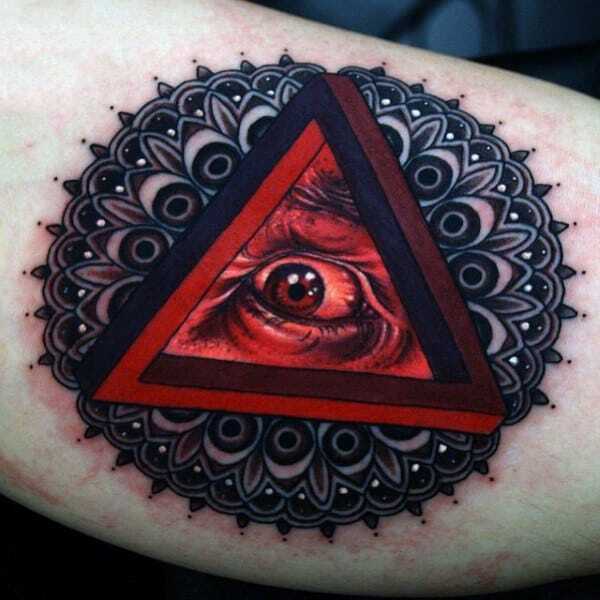 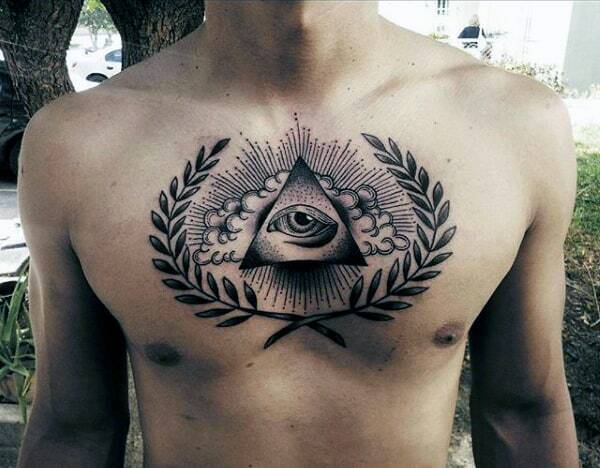 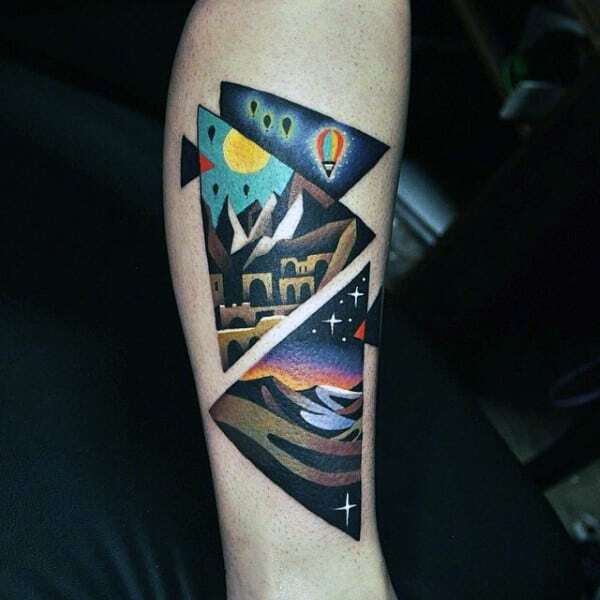 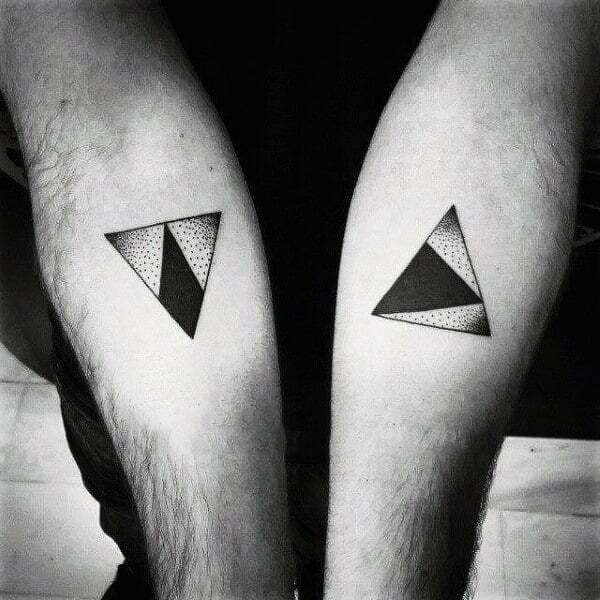 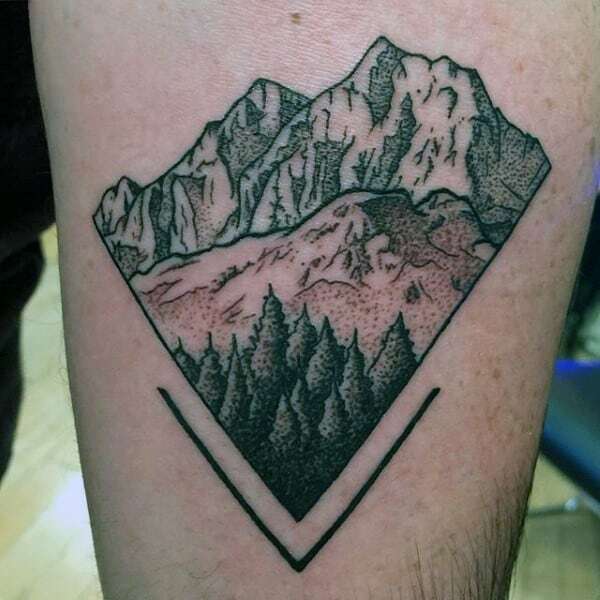 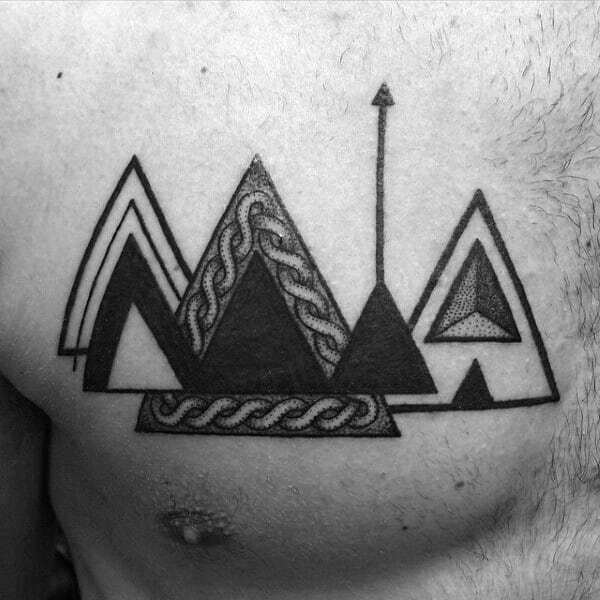 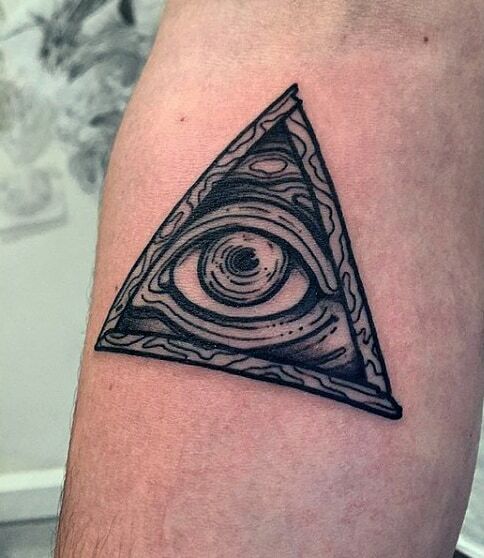 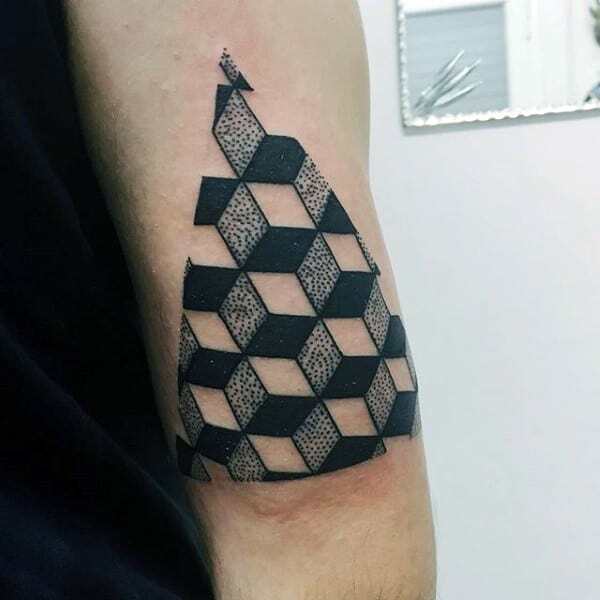 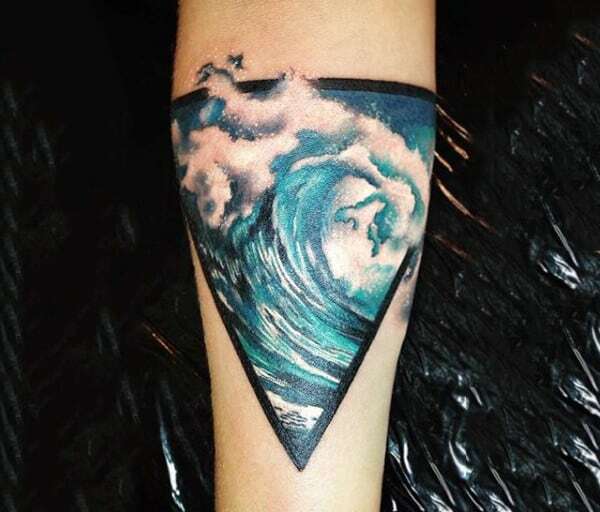 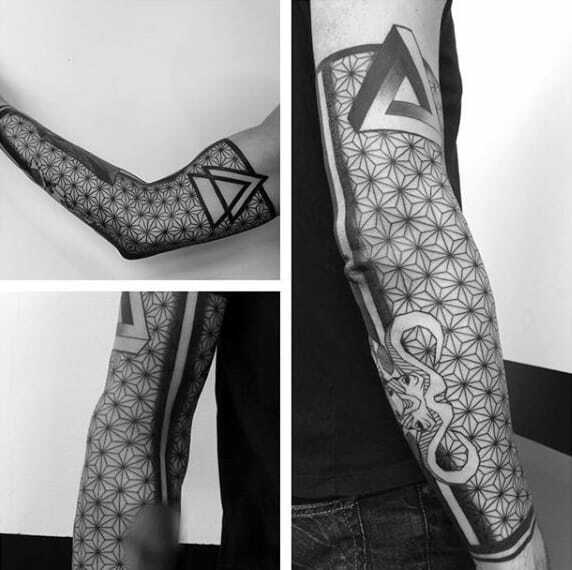 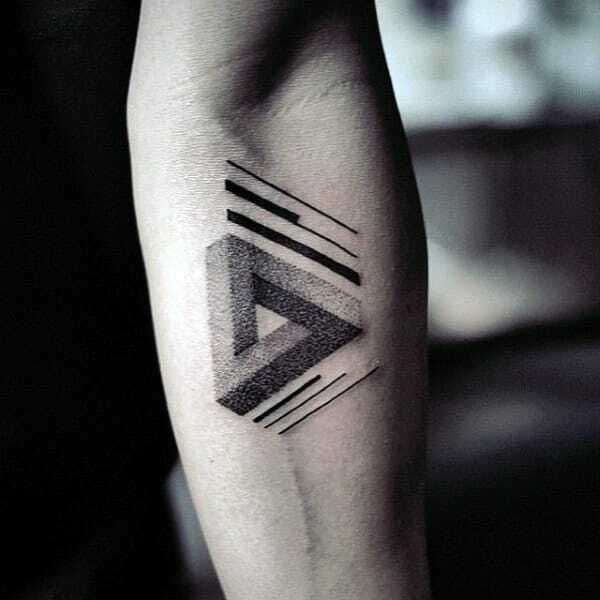 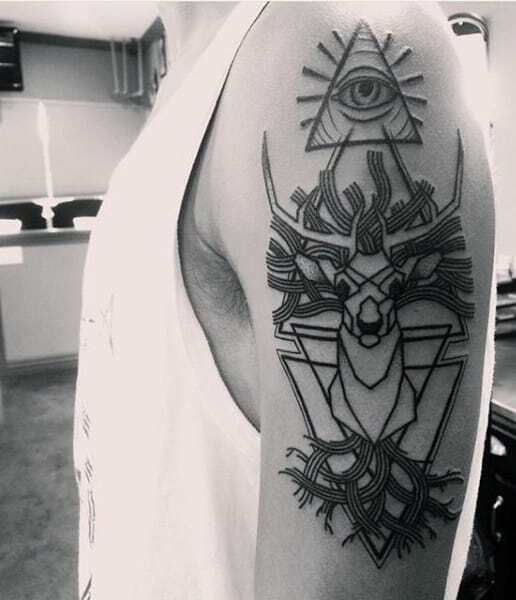 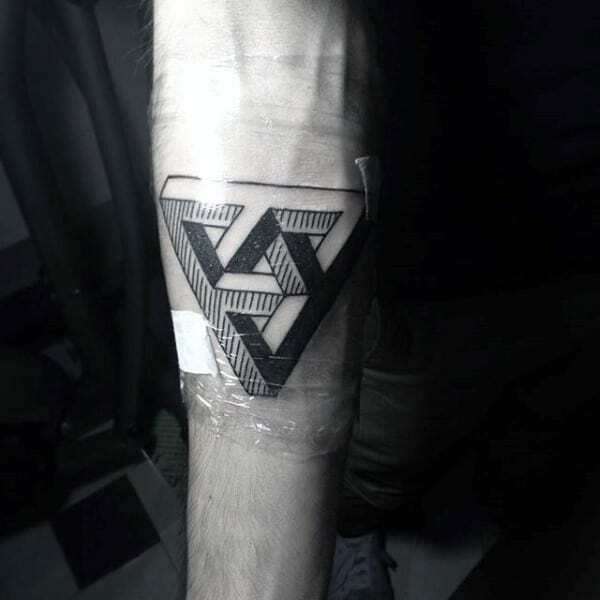 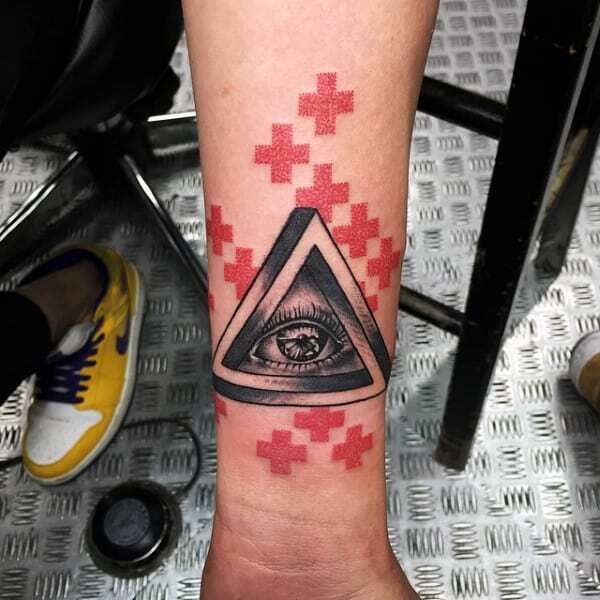 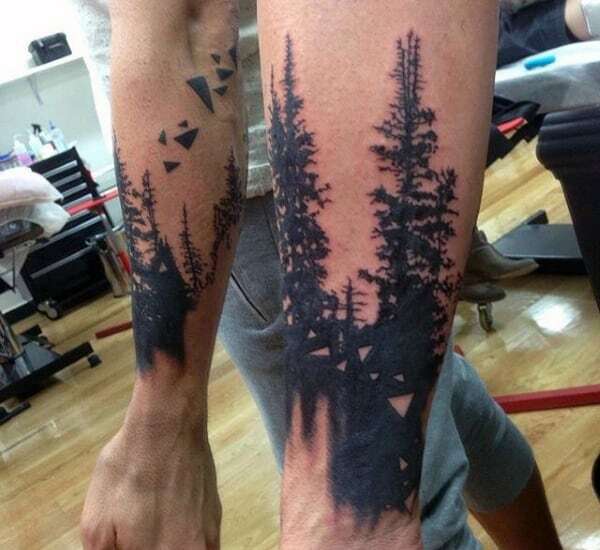 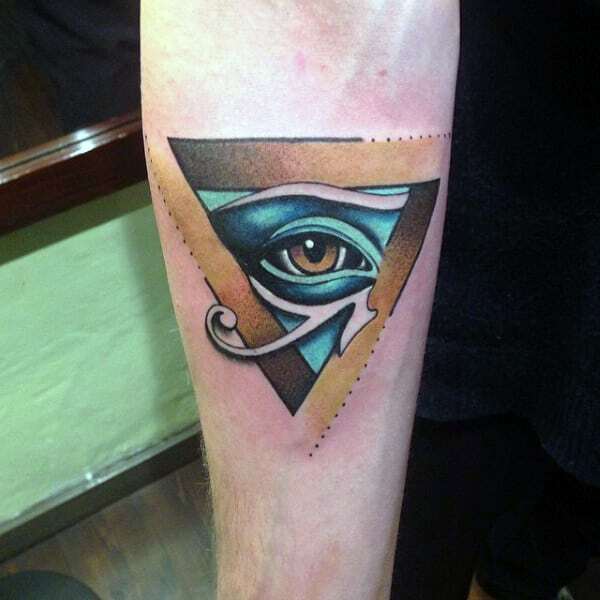 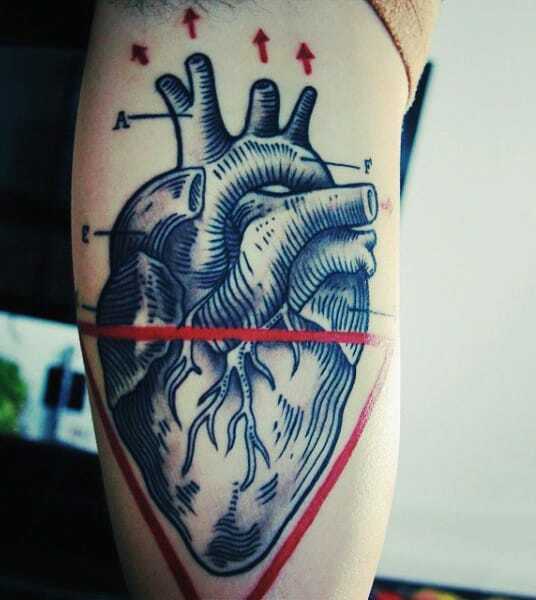 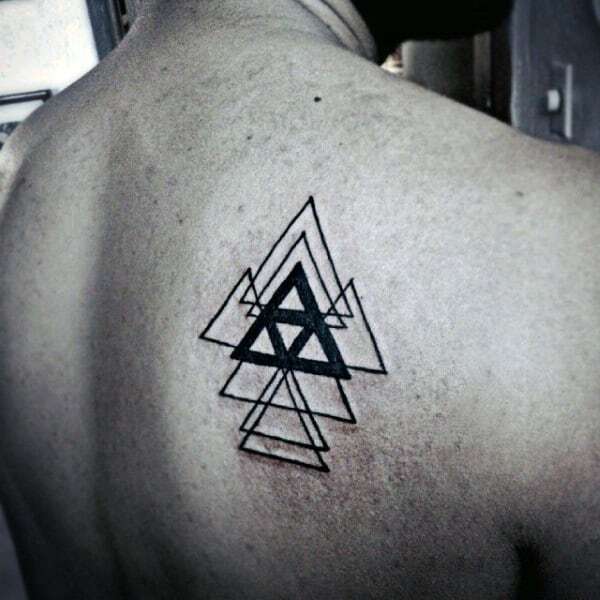 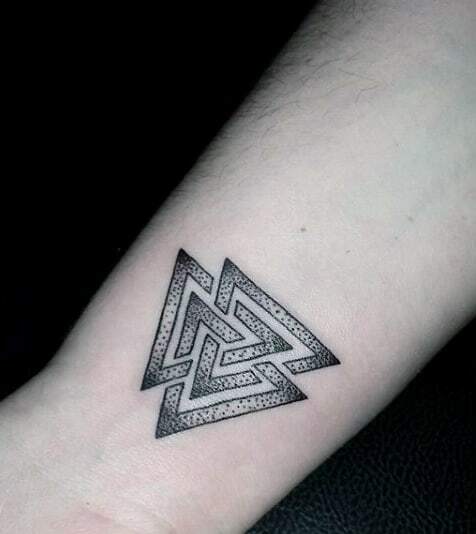 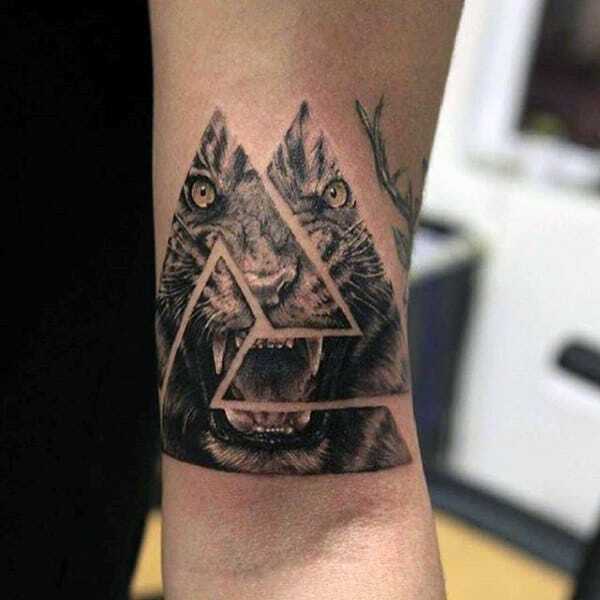 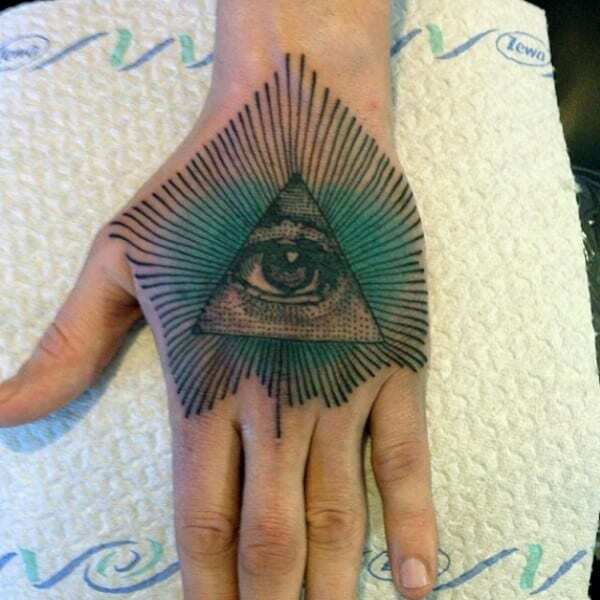 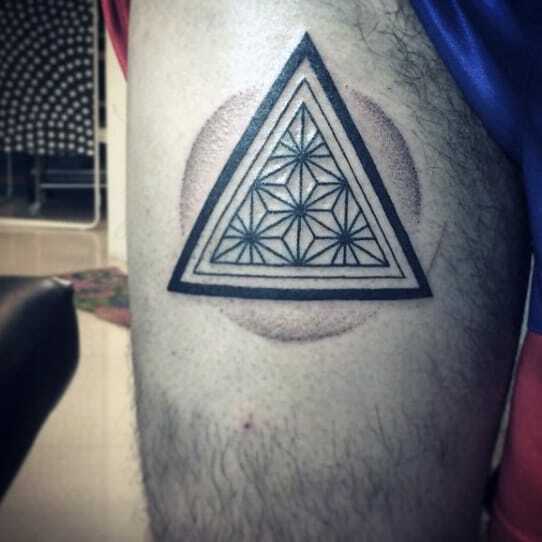 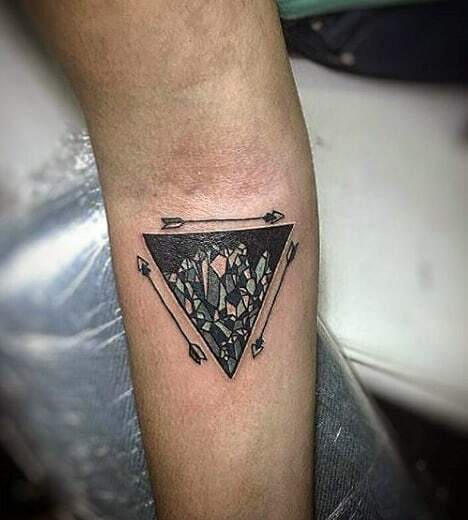 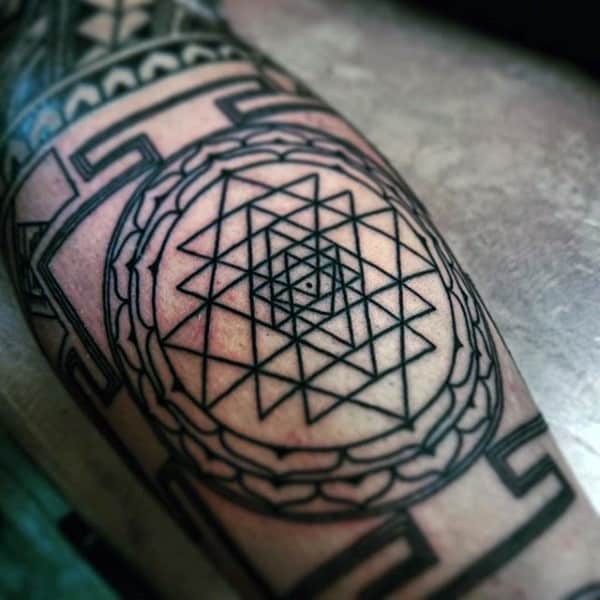 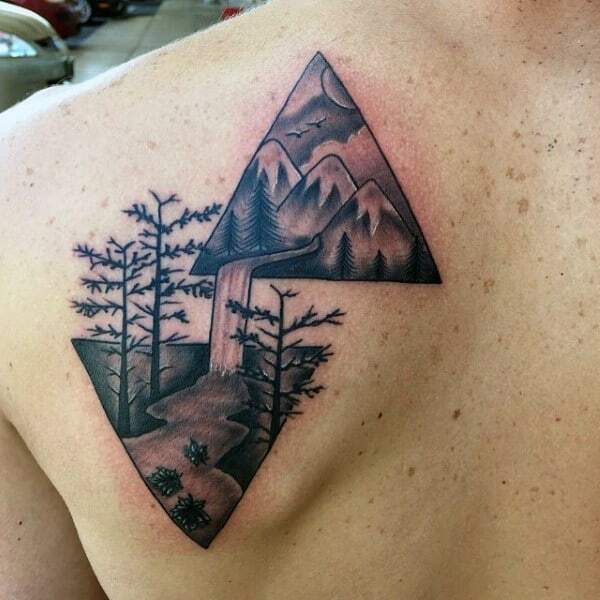 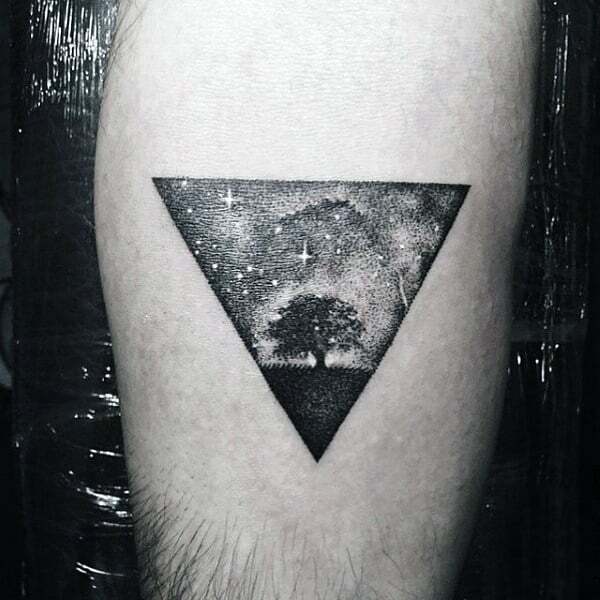 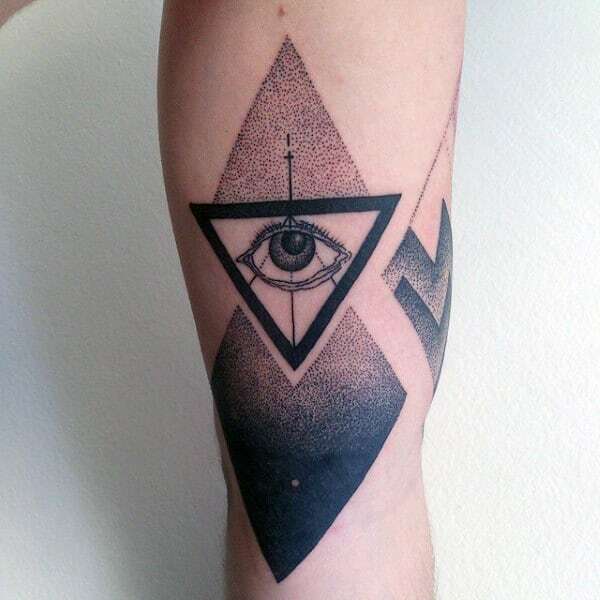 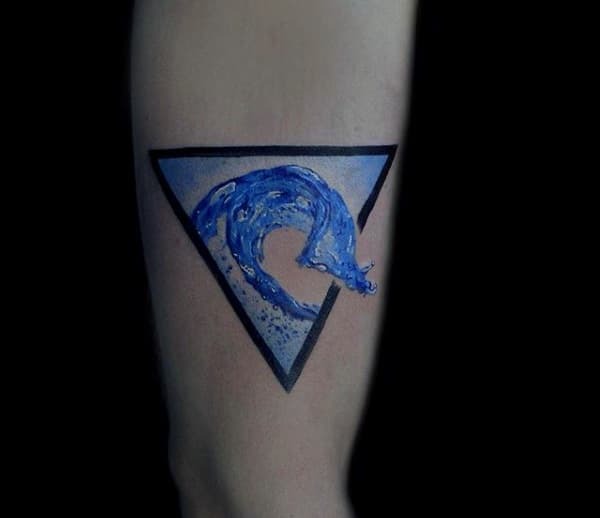 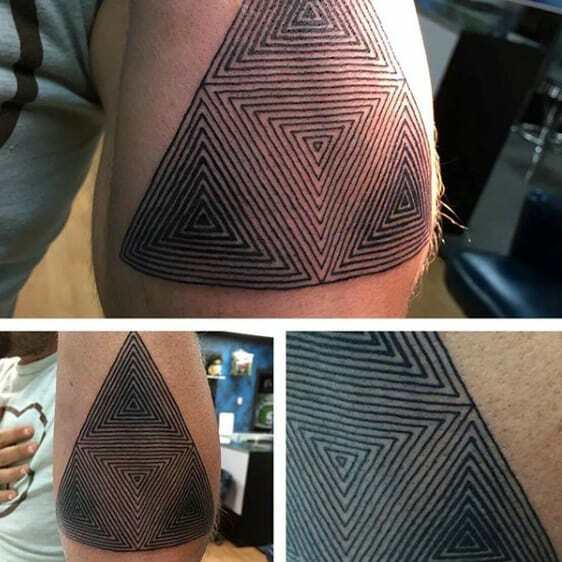 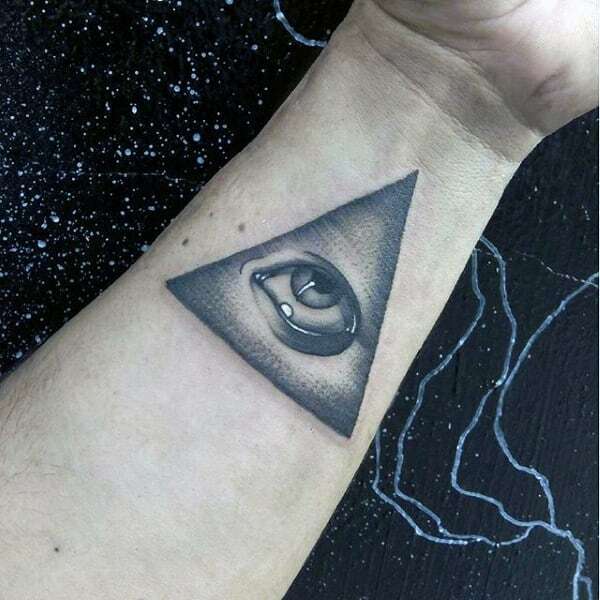 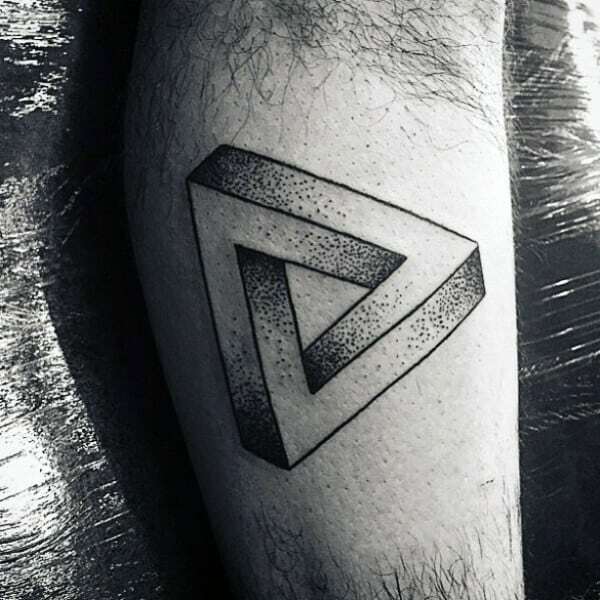 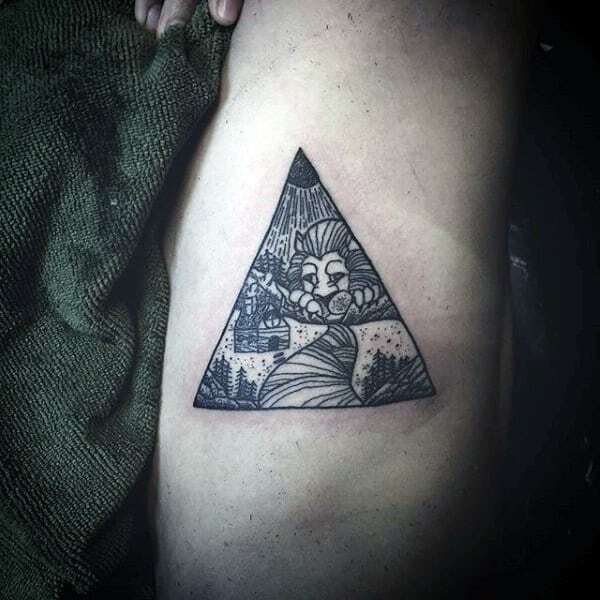 Regardless, you’re sure to enjoy these top 90 best triangle tattoo designs for men. 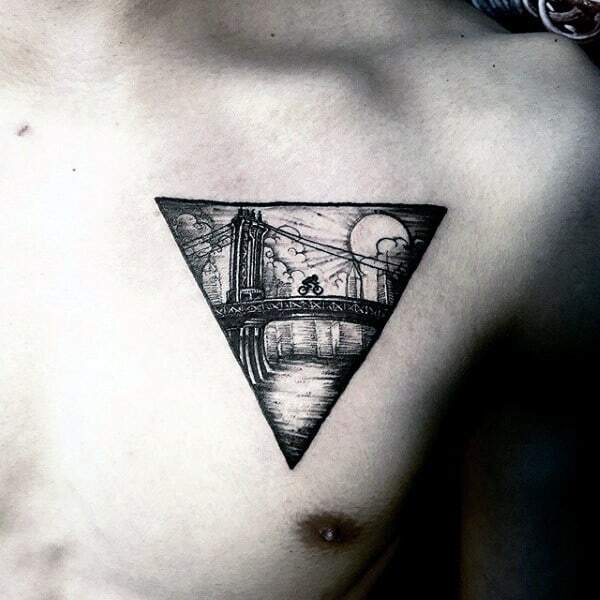 From full sleeves to small ideas inked on the chest, there’s plenty of inspiration to discover.